This article is about the fruit. For other uses, see Lemon (disambiguation). Not to be confused with Iemon. The lemon, Citrus limon (L.) Osbeck, is a species of small evergreen tree in the flowering plant family Rutaceae, native to South Asia, primarily North eastern India. The tree's ellipsoidal yellow fruit is used for culinary and non-culinary purposes throughout the world, primarily for its juice, which has both culinary and cleaning uses. The pulp and rind (zest) are also used in cooking and baking. The juice of the lemon is about 5% to 6% citric acid, with a pH of around 2.2, giving it a sour taste. The distinctive sour taste of lemon juice makes it a key ingredient in drinks and foods such as lemonade and lemon meringue pie. The origin of the lemon is unknown, though lemons are thought to have first grown in Assam (a region in northeast India), northern Burma or China. A genomic study of the lemon indicated it was a hybrid between bitter orange (sour orange) and citron. In 1747, James Lind's experiments on seamen suffering from scurvy involved adding lemon juice to their diets, though vitamin C was not yet known as an important dietary ingredient. The origin of the word lemon may be Middle Eastern. The word draws from the Old French limon, then Italian limone, from the Arabic laymūn or līmūn, and from the Persian līmūn, a generic term for citrus fruit, which is a cognate of Sanskrit (nimbū, “lime”). The 'Bonnie Brae' is oblong, smooth, thin-skinned and seedless. These are mostly grown in San Diego County, USA. The 'Eureka' grows year-round and abundantly. This is the common supermarket lemon, also known as 'Four Seasons' (Quatre Saisons) because of its ability to produce fruit and flowers together throughout the year. This variety is also available as a plant to domestic customers. There is also a pink-fleshed Eureka lemon, with a green and yellow variegated outer skin. Lemons contain numerous phytochemicals, including polyphenols, terpenes, and tannins. Lemon juice contains slightly more citric acid than lime juice (about 47 g/l), nearly twice the citric acid of grapefruit juice, and about five times the amount of citric acid found in orange juice. Lemon juice, rind, and peel are used in a wide variety of foods and drinks. The whole lemon is used to make marmalade, lemon curd and lemon liqueur. Lemon slices and lemon rind are used as a garnish for food and drinks. Lemon zest, the grated outer rind of the fruit, is used to add flavor to baked goods, puddings, rice, and other dishes. Lemon juice is used to make lemonade, soft drinks, and cocktails. It is used in marinades for fish, where its acid neutralizes amines in fish by converting them into nonvolatile ammonium salts. In meat, the acid partially hydrolyzes tough collagen fibers, tenderizing the meat, but the low pH denatures the proteins, causing them to dry out when cooked. In the United Kingdom, lemon juice is frequently added to pancakes, especially on Shrove Tuesday. In Morocco, lemons are preserved in jars or barrels of salt. The salt penetrates the peel and rind, softening them, and curing them so that they last almost indefinitely. The preserved lemon is used in a wide variety of dishes. Preserved lemons can also be found in Sicilian, Italian, Greek, and French dishes. A major industry use of the peel is manufacturing of pectin - a polysaccharide used as a gelling agent, thickening agent and stabilizer in food and other products. The juice of the lemon may be used for cleaning. A halved lemon dipped in salt or baking powder is used to brighten copper cookware. The acid dissolves the tarnish, and the abrasives assist the cleaning. As a kitchen cleaning agent the juice can deodorize, remove grease, bleach stains, and disinfect; when mixed with baking soda, it removes stains from plastic food storage containers. The oil of the lemon's peel also has various uses. It is used as a wood cleaner and polish, where its solvent property is employed to dissolve old wax, fingerprints, and grime. Lemon oil and orange oil are also used as a nontoxic insecticide treatment. Lemon oil may be used in aromatherapy. Lemon oil aroma does not influence the human immune system, but may contribute to relaxation. Lemons need a minimum temperature of around 7 °C (45 °F), so they are not hardy year-round in temperate climates, but become hardier as they mature. Citrus require minimal pruning by trimming overcrowded branches, with the tallest branch cut back to encourage bushy growth. Throughout summer, pinching back tips of the most vigorous growth assures more abundant canopy development. As mature plants may produce unwanted, fast-growing shoots called ‘water shoots,’ these are removed from the main branches at the bottom or middle of the plant. In cultivation in the UK, the cultivars ‘Meyer’ and ‘Variegata’ have gained the Royal Horticultural Society’s Award of Garden Merit (confirmed 2017). In 2016, world production of lemons (combined with limes for reporting) was 17.3 million tonnes. The top producers were India, Mexico, China, Argentina and Brazil, collectively accounting for 62% of total production (table). Meyer lemon, a cross between a citron and a mandarin/pomelo hybrid distinct from sour or sweet orange, named after Frank N. Meyer, who first introduced it to the United States in 1908. Thin-skinned and slightly less acidic than the Lisbon and Eureka lemons, Meyer lemons require more care when shipping and are not widely grown on a commercial basis. Meyer lemons often mature to a yellow-orange color. They are slightly more frost-tolerant. Ponderosa lemon, more cold-sensitive than true lemons, the fruit are thick-skinned and very large. Genetic analysis showed it to be a complex hybrid of citron and pomelo. Sweet lemons or sweet limes, a mixed group including the lumia (pear lemon), limetta, and Palestinian sweet lime. Among them is the Jaffa lemon, a pomelo-citron hybrid. 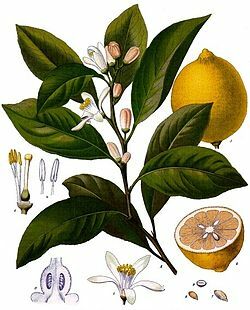 ^ "The Plant List:Citrus limon (L.) Osbeck". Royal Botanic Gardens Kew and Missouri Botanic Garden. Retrieved February 20, 2017. ^ a b c d e f g h i j Julia F. Morton (1987). "Lemon in Fruits of Warm Climates". Purdue University. pp. 160–168. ^ Gulsen, O.; M. L. Roose (2001). "Lemons: Diversity and Relationships with Selected Citrus Genotypes as Measured with Nuclear Genome Markers". Journal of the American Society of Horticultural Science. 126: 309–317. ^ James Lind (1757). A treatise on the scurvy. Second edition. London: A. Millar. ^ Douglas Harper. "Online Etymology Dictionary". ^ Spalding, William A. (1885). The orange: its culture in California. Riverside, California: Press and Horticulturist Steam Print. p. 88. Retrieved March 2, 2012. ^ Carque, Otto (2006) . Rational Diet: An Advanced Treatise on the Food Question. Los Angeles, California: Kessinger Publishing. p. 195. ISBN 978-1-4286-4244-7. Retrieved March 2, 2012. ^ "Complete List of Four Winds Dwarf Citrus Varieties". Fourwindsgrowers.com. Retrieved June 6, 2010. ^ Buchan, Ursula (January 22, 2005). "Kitchen garden: lemon tree". The Daily Telegraph. London. Retrieved January 24, 2014. ^ "Taste of a thousand lemons". Los Angeles Times. September 8, 2004. Retrieved November 21, 2011. ^ "New Zealand Citrus". ceventura.ucdavis.edu. Retrieved June 13, 2010. ^ Penniston KL, Nakada SY, Holmes RP, Assimos DG (2008). "Quantitative Assessment of Citric Acid in Lemon Juice, Lime Juice, and Commercially-Available Fruit Juice Products" (PDF). Journal of Endourology. 22 (3): 567–570. doi:10.1089/end.2007.0304. PMC 2637791. PMID 18290732. ^ M. Hofrichter (2010). Industrial Applications. Springer. p. 224. ISBN 978-3-642-11458-8. ^ Kiecolt-Glaser, J. K.; Graham, J. E.; Malarkey, W. B.; Porter, K; Lemeshow, S; Glaser, R (2008). "Olfactory influences on mood and autonomic, endocrine, and immune function". Psychoneuroendocrinology. 33 (3): 328–39. doi:10.1016/j.psyneuen.2007.11.015. PMC 2278291. PMID 18178322. ^ Cooke, B; Ernst, E (2000). "Aromatherapy: A systematic review". British Journal of General Practice. 50 (455): 493–6. PMC 1313734. PMID 10962794. ^ "Lemon Power". California Energy Commission. Retrieved December 7, 2014. ^ Mirsky, Steve (April 20, 2010). "Invisible Ink and More: The Science of Spying in the Revolutionary War". Scientific American. Retrieved October 15, 2016. ^ a b c "Citrus". Royal Horticultural Society. 2017. Retrieved 19 April 2017. ^ "RHS Plantfinder - Citrus × limon 'Meyer'". Retrieved 30 January 2018. ^ "RHS Plantfinder - Citrus × limon 'Variegata'". Retrieved 30 January 2018. ^ "AGM Plants - Ornamental" (PDF). Royal Horticultural Society. July 2017. p. 20. Retrieved 24 January 2018. ^ a b "World production of lemons and limes in 2016; Crops/Regions/World/Production Quantity from pick lists". Food and Agriculture Organization of the United Nations, Statistics Division (FAOSTAT). 2017. Retrieved 7 November 2018. ^ a b c d e Curk, Franck; Ollitrault, Frédérique; Garcia-Lor, Andres; Luro, François; Navarro, Luis; Ollitrault, Patrick (2016). "Phylogenetic origin of limes and lemons revealed by cytoplasmic and nuclear markers". Annals of Botany. 11: 565–583. doi:10.1093/aob/mcw005. PMC 4817432. Wikimedia Commons has media related to Citrus × limon. Look up lemon in Wiktionary, the free dictionary.